W bosons are very massive. The equivalent mass of a W+ and W– boson is some 86.3 atomic mass units (amu): that’s about the same as a rubidium or strontium atom. The mass of a Z boson is even larger: roughly equivalent to the mass of a molybdenium atom (98 amu). That is extremely heavy: just compare with iron or silver, which have a mass of about 56 amu and 108 amu respectively. Because they are so massive, W bosons cannot travel very far before disintegrating (they actually go (almost) nowhere), which explains why the weak force is very short-range only, and so that’s yet another fundamental difference as compared to the other fundamental forces. The electric charge of W and Z bosons explains why we have a trio of weak force carriers rather than just one: W+, W– and Z0. Feynman calls them “the three W’s”. The electric charge of W and Z bosons is what it is: an electric charge – just like protons and electrons. Hence, one has to distinguish it from the the weak charge as such: the weak charge (or, to be correct, I should say the weak isospin number) of a particle (such as a proton or a neutron for example) is related to the propensity of that particle to interact through the weak force — just like the electric charge is related to the propensity of a particle to interact through the electromagnetic force (think about Coulomb’s law for example: likes repel and opposites attract), and just like the so-called color charge (or the (strong) isospin number I should say) is related to the propensity of quarks (and gluons) to interact with each other through the strong force. 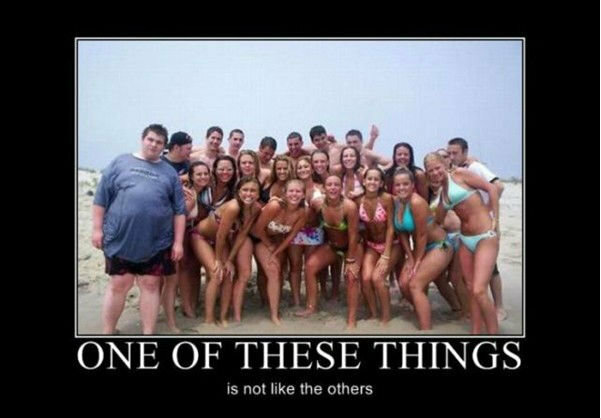 Well… That says it all, I think. And from what I can see, the (tentative) confirmation of the existence of the Higgs field has not made these ‘seams’ any less visible. However, before criticizing eminent scientists such as Weinberg and Salam, we should obviously first have a closer look at those W bosons without any prejudice. Atomic decay, in general, is a loss of energy accompanying a transformation of the nucleus of the atom. 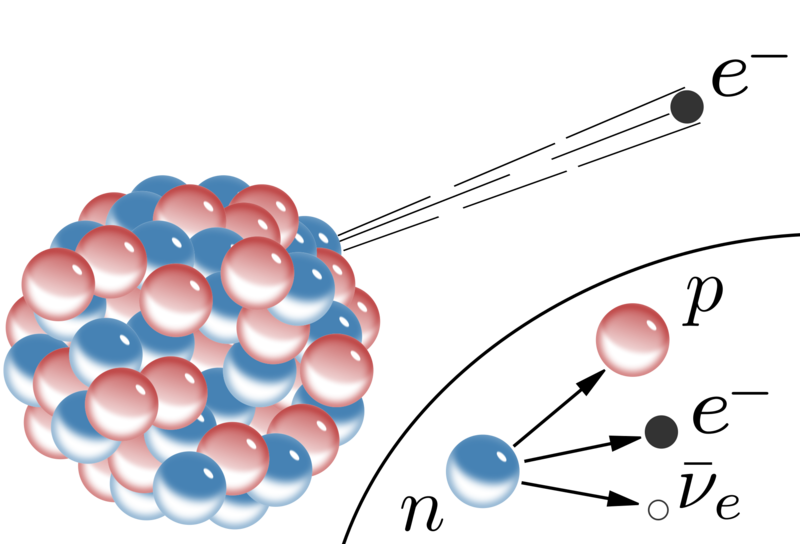 Alpha decay occurs when the nucleus ejects an alpha particle: an α-particle consist of two protons and two neutrons bound together and, hence, it’s identical to a helium nucleus. Alpha particles are commonly emitted by all of the larger radioactive nuclei, such as uranium (which becomes thorium as a result of the decay process), or radium (which becomes radon gas). However, alpha decay is explained by a mechanism not involving the weak force: the electromagnetic force and the nuclear force (i.e. the strong force) will do. The reasoning is as follows: the alpha particle can be looked at as a stable but somewhat separate particle inside the nucleus. Because of their charge (both positive), the alpha particle inside of the nucleus and ‘the rest of the nucleus’ are subject to strong repulsive electromagnetic forces between them. However, these strong repulsive electromagnetic forces are not as strong as the strong force between the quarks that make up matter and, hence, that’s what keeps them together – most of the time that is. Let me be fully complete here. The so-called nuclear force between composite particles such as protons and neutrons – or between clusters of protons and neutrons in this case – is actually the residual effect of the strong force. 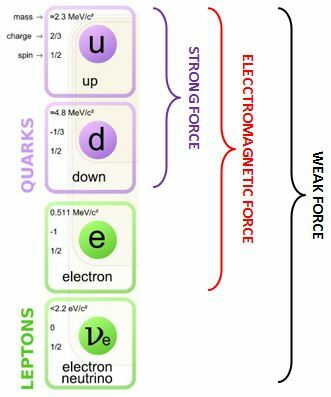 The strong force itself is between quarks – and between them only – and so that’s what binds them together in protons and neutrons (so that’s the next level of aggregation you might say). Now, the strong force is mostly neutralized within those protons and neutrons, but there is some residual force, and so that’s what keeps a nucleus together and what is referred to as the nuclear force. There is a very helpful analogy here: the electromagnetic forces between neutral atoms (and/or molecules)—referred to as van der Waals forces (that’s what explains the liquid shape of water, among other things)— are also the residual of the (much stronger) electromagnetic forces that tie the electrons to the nucleus. The name is obvious: a well is a hole in the ground from which you can get water (or oil or gas or whatever). Now, the sea level might actually be lower than the bottom of a well, but the water would still stay in the well. In the illustration above, we are not depicting water levels but energy levels, but it’s equally obvious it would require some energy to kick a particle out of this well: if it would be water, we’d require a pump to get it out but, of course, it would be happy to flow to the sea once it’s out. Indeed, once a charged particle would be out (I am talking our alpha particle now), it will obviously stay out because of the repulsive electromagnetic forces coming into play (positive charges reject each other). Well, the energy may come from outside – that’s what’s referred to as induced radioactive decay (just Google it and you will tons of articles on experiments involving laser-induced accelerated alpha decay) – or, and that’s much more intriguing, the Uncertainty Principle comes into play. Huh? Yes. According to the Uncertainty Principle, the energy of our alpha particle inside of the nucleus wiggles around some mean value but our alpha particle would also have an amplitude to have some higher energy level. That results not only in a theoretical probability for it to escape out of the well but also into something actually happening if we wait long enough: the amplitude (and, hence, the probability) is tiny, but it’s what explains the decay process – and what gives U-232 a half-life of 68.9 years, and also what gives the more common U-238 a much more comfortable 4.47 billion years as the half-life period. Now that we’re talking about wells and all that, we should also mention that this phenomenon of getting out of the well is referred to as quantum tunneling. You can easily see why: it’s like the particle dug its way out. However, it didn’t: instead of digging under the sidewall, it sort of ‘climbed over’ it. Think of it being stuck and trying and trying and trying – a zillion times – to escape, until it finally did. So now you understand this fancy word: quantum tunneling. However, this post is about the weak force and so let’s discuss beta decay now. You’ll remember these formulas from your high-school days: beta decay does not change the mass number (carbon and nitrogen have the same mass: 14 units) but it does change the atomic (or proton) number: nitrogen has an extra proton. So one of the neutrons became a proton ! [The second equation shows the opposite: a proton became a neutron.] In order to do that, the carbon atom had to eject a negative charge: that’s the electron you see in the equation above. In addition, there is also the ejection of a anti-neutrino (that’s what the bar above the ve symbol stands for: antimatter). You’ll wonder what an antineutrino could possibly be. Don’t worry about it: it’s not any spookier than the neutrino. Neutrinos and anti-neutrinos have no electric charge and so you cannot distinguish them on that account (electric charge). However, all antineutrinos have right-handed helicity (i.e. they come in only one of the two possible spin states), while the neutrinos are all left-handed. That’s why beta-decay is said to not respect parity symmetry, aka as mirror symmetry. Hence, in the case of beta decay, Nature does distinguish between the world and the mirror world ! I’ll come back on that but let me first lighten up the discussion somewhat with a graphical illustration of that neutron-proton transformation. Now, you surely will have several serious questions. The most obvious question is what happens with the electron and the neutrino? Well… Those spooky neutrinos are gone before you know it and so don’t worry about them. As for the electron, the carbon had only six electrons but the nitrogen needs seven to be electrically neutral… So you might think the new atom will take care of it. Well… No. Sorry. Because of its kinetic energy, the electron is likely to just explore the world and crash into something else, and so we’re left with a positively charged nitrogen ion indeed. So I should have added a little + sign next to the N in the formula above. Of course, one cannot exclude the possibility that this ion will pick up the electron later – but don’t bet on it: the ion might have to absorb another electron, or not find any free electrons ! As for the positron (in a β+ decay), that will just grab the nearest electron around and auto-destruct—thereby generating two high-energy photons (so that’s a little light flash). The net result is that we do not have an ion but a neutral sodium atom. Because the nearest electron will usually be found on some shell around the nucleus (the K or L shell for example), such process is often described as electron capture, and the ‘transformation equation’ can then be written p + e– → n + ve (with p and n denoting a proton and a neutron respectively). The more important question is: where are the W and Z bosons in this story? Ah ! Yes! Sorry I forgot about them. The Feynman diagram below shows how it really works—and why the name of intermediate vector bosons for these three strange ‘particles’ (W+, W–, and Z0) is so apt. These W bosons are just a short trace of ‘something’ indeed: their half-life is about 3×10−25 s, and so that’s the same order of magnitude (or minitude I should say) as the mean lifetime of other resonances observed in particle collisions. Indeed, you’ll notice that, in this so-called Feynman diagram, there’s no space axis. That’s because the distances involved are so tiny that we have to distort the scale—so we are not using equivalent time and distance units here, as Feynman diagrams should. That’s in line with a more prosaic description of what may be happening: W bosons mediate the weak force by seemingly absorbing an awful lot of momentum, spin, and whatever other energy related to all of the qubits describing the particles involved, to then eject an electron (or positron) and a neutrino (or an anti-neutrino). Hmm… That’s not a standard description of a W boson as a force carrying particle, you’ll say. You’re right. This is more the description of a Z boson. What’s the Z boson again? Well… I haven’t explained it yet. It’s not involved in beta decay. There’s a process called elastic scattering of neutrinos. Elastic scattering means that some momentum is exchanged but neither the target (an electron or a nucleus) nor the incident particle (the neutrino) are affected as such (so there’s no break-up of the nucleus for example). In other words, things bounce back and/or get deflected but there’s no destruction and/or creation of particles, which is what you would have with inelastic collisions. Let’s examine what happens here. It’s easy to generate neutrino beams: remember their existence was confirmed in 1956 because nuclear reactors create a huge flux of them ! 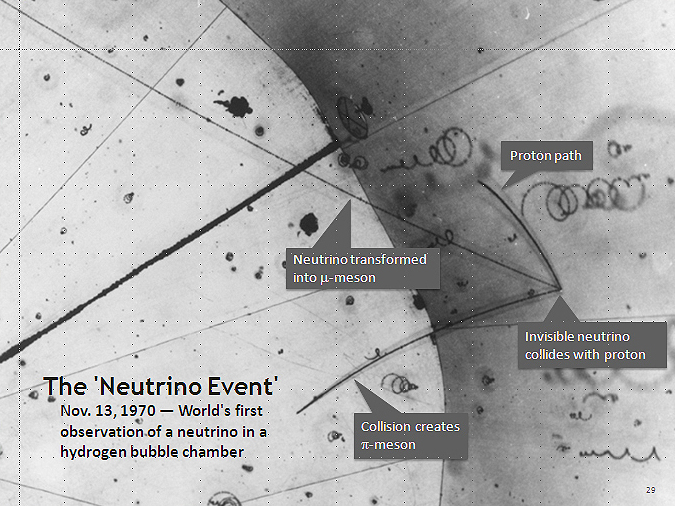 So it’s easy to send lots of high-energy neutrinos into a cloud or bubble chamber and see what happens. Cloud and bubble chambers are prehistoric devices which were built and used to detect electrically charged particles moving through it. I won’t go into too much detail but I can’t resist inserting a few historic pictures here. 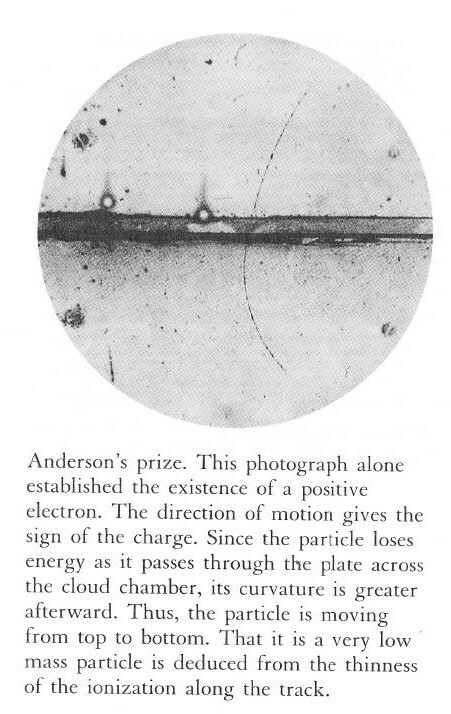 The first two pictures below document the first experimental confirmation of the existence of positrons by Carl Anderson, back in 1932 (and, no, he’s not Danish but American), for which he got a Nobel Prize. The magnetic field which gives the positron some curvature—the trace of which can be seen in the image on the right—is generated by the coils around the chamber. Note the opening in the coils, which allows for taking a picture when the supersaturated vapor is suddenly being decompressed – and so the charged particle that goes through it leaves a trace of ionized atoms behind that act as ‘nucleation centers’ around which the vapor condenses, thereby forming tiny droplets. Quite incredible, isn’t it? One can only admire the perseverance of these early pioneers. The point to note is that these spooky neutrinos collide with other matter particles. In the image above, it’s a proton, but so when you’re shooting neutrino beams through a bubble chamber, a few of these neutrinos can also knock electrons out of orbit, and so that electron will seemingly appear out of nowhere in the image and move some distance with some kinetic energy (which can all be measured because magnetic fields around it will give the electron some curvature indeed, and so we can calculate its momentum and all that). Of course, they will tend to move in the same direction – more or less at least – as the neutrinos that knocked them loose. So it’s like the Compton scattering which we discussed earlier (from which we could calculate the so-called classical radius of the electron – or its size if you will)—but with one key difference: the electrons get knocked loose not by photons, but by neutrinos. But… How can they do that? Photons carry the electromagnetic field so the interaction between them and the electrons is electromagnetic too. But neutrinos? Last time I checked, they were matter particles, not bosons. And they carry no charge. So what makes them scatter electrons? OK-OK-OK. I got it ! So here it must be the strong force or something. Well… No. Neutrinos are not made of quarks. You’ll immediately ask what they are made of – but the answer is simple: they are what they are – one of the four matter particles in the Standard Model – and so they are not made of anything else. Capito? OK-OK-OK. I got it ! It must be gravity, no? Perhaps these neutrinos don’t really hit the electron: perhaps they skim near it and sort of drag it along as they pass? No. It’s not gravity either. It can’t be. We have no exact measurement of the mass of a neutrino but it’s damn close to zero – and, hence, way too small to exert any such influence on an electron. It’s just not consistent with those traces. OK-OK-OK. I got it ! It’s that weak force, isn’t it? YES ! The Feynman diagrams below show the mechanism involved. 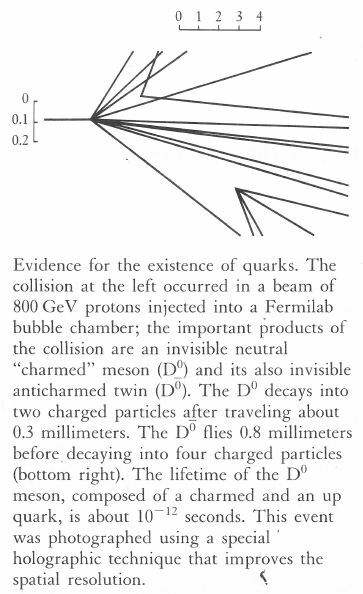 As far as terminology goes (remember Feynman’s complaints about the up, down, strange, charm, beauty and truths quarks? ), I think this is even worse. The interaction is described as a current, and when the neutral Z boson is involved, it’s called a neutral current – as opposed to… Well… Charged currents. Neutral and charged currents? That sounds like sweet and sour candy, isn’t it? But isn’t candy supposed to be sweet? Well… No. Sour candy is pretty common too. And so neutral currents are pretty common too. You obviously don’t believe a word of what I am saying and you’ll wonder what the difference is between these charged and neutral currents. The end result is the same in the first two pictures: an electron and a neutrino interact, and they exchange momentum. So why is one current neutral and the other charged? In fact, when you ask that question, you are actually wondering whether we need that neutral Z boson. W bosons should be enough, no? No. The first and second picture are “the same but different”—and you know what that means in physics: it means it’s not the same. It’s different. Full stop. In the second picture, there is electron absorption (only for a very brief moment obviously, but so that’s what it is, and you don’t have that in the first diagram) and then electron emission, and there’s also neutrino absorption and emission. […] I can sense your skepticism – and I actually share it – but that’s what I understand of it ! […] So what’s the third picture? Well… That’s actually beta decay: a neutron becomes a proton, and there’s emission of an electron and… Hey ! Wait a minute ! This is interesting: this is not what we wrote above: we have an incoming neutrino instead of an outgoing anti-neutrino here. So what’s this? Well… I got this illustration from a blog on physics (Galileo’s Pendulum – The Flavor of Neutrinos) which, in turn, mentions Physics Today as its source. The incoming neutrino has nothing to do with the usual representation of an anti-matter particle as a particle traveling backwards in time. It’s something different, and it triggers a very interesting question: could beta decay possibly be ‘triggered’ by neutrinos? Who knows? I googled it, and there seems to be some evidence supporting such thesis. However, this ‘evidence’ is flimsy (the only real ‘clue’ is that the activity of the Sun, as measured by the intensity of solar flares, seems to be having some (tiny) impact on the rate of decay of radioactive elements on Earth) and, hence, most ‘serious’ scientists seem to reject that possibility. I wonder why: it would make the ‘weird force’ somewhat less weird in my view. So… What to say? Well… Nothing much at this moment. Let me move on and examine the question a bit more in detail in a Post Scriptum. It is a weird asymmetry: almost massless particles (neutrinos) interact with other particles through massive bosons, and these massive ‘things’ are supposed to be ‘bosons’, i.e. force carrying particles ! These physicists must be joking, right? 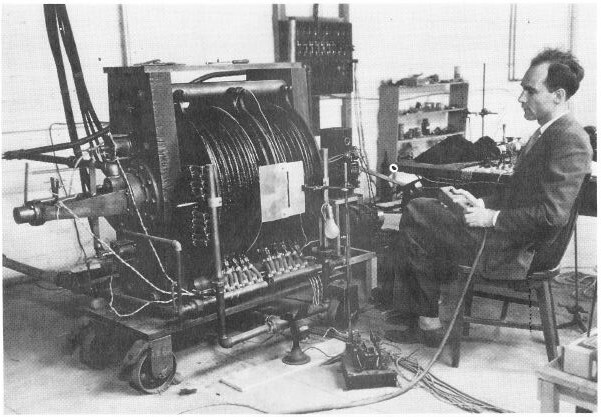 These bosons can hardly carry themselves – as evidenced by the fact they peter out just like all of those other ‘resonances’ ! Hmm… Not sure what to say. It’s true that their honorific title – ‘intermediate vectors’ – seems to be quite apt: they are very intermediate indeed: they only appear as a short-lived stage in between the initial and final state of the system. Again, it leads one to think that these W bosons may just reflect some kind of energy blob caused by some neutrino – or anti-neutrino – crashing into another matter particle (a quark or an electron). Whatever it is, this weak force is surely the odd one out. In my previous post, I mentioned other asymmetries as well. Let’s revisit them. There’s so much diversity – a truly incredible range of chemical elements making life what it is. But so all these chemical elements have been produced through a process of nuclear fusion in stars (stellar nucleosynthesis), which were then blasted into space by supernovae, and so they then coagulated into planets like ours. However, all of the heavier atoms will decay back into some lighter element because of radioactive decay, as shown in the graph below. So we are doomed ! In fact, some of the GUT theorists think that there is no such thing as ‘stable nuclides’ (that’s the black line in the graph above): they claim that all atomic species will decay because – according to their line of reasoning – the proton itself is NOT stable. WHAT? Yeah ! That’s what Feynman complained about too: he obviously doesn’t like these GUT theorists either. Of course, there is an expensive experiment trying to prove spontaneous proton decay: the so-called Super-K under Mount Kamioka in Japan. It’s basically a huge tank of ultra-pure water with a lot of machinery around it… Just google it. It’s fascinating. If, one day, it would be able to prove that there’s proton decay, our Standard Model would be in very serious problems – because it doesn’t cater for unstable protons. That being said, I am happy that has not happened so far – because it would mean our world would really be doomed. What do I mean with that? We’re all doomed, aren’t we? If only because of the Second Law of Thermodynamics. Huh? Yes. That ‘law’ just expresses a universal principle: all kinetic and potential energy observable in nature will, in the end, dissipate: differences in temperature, pressure, and chemical potential will even out. Entropy increases. Time is NOT reversible: it points in the direction of increasing entropy – till all is the same once again. Sorry? Don’t worry about it. When everything is said and done, we humans – or life in general – are an amazing negation of the Second Law of Thermodynamics: temperature, pressure, chemical potential and what have you – it’s all super-organized and super-focused in our body ! But it’s temporary indeed – and we actually don’t negate the Second Law of Thermodynamics: we create order by creating disorder. In any case, I don’t want to dwell on this point. Time reversibility in physics usually refers to something else: time reversibility would mean that all basic laws of physics (and with ‘basic’, I am excluding this higher-level Second Law of Thermodynamics) would be time-reversible: if we’d put in minus t (–t) instead of t, all formulas would still make sense, wouldn’t they? So we could – theoretically – reverse our clock and stopwatches and go back in time. Well… We can reverse a lot. For example, U-232 decays into a lot of other stuff BUT we can produce U-232 from scratch once again—from thorium to be precise. In fact, that’s how we got it in the first place: as mentioned above, any natural U-232 that might have been produced in those stellar nuclear fusion reactors is gone. But so that means that alpha decay is reversible: we’re producing stable stuff – U-232 lasts for dozens of years – that probably existed long time ago but so it decayed and now we’re reversing the arrow of time using our nuclear science and technology. Now, you may object that you don’t see Nature spontaneously assemble the nuclear technology we’re using to produce U-232, except if Nature would go for that Big Crunch everyone’s predicting so it can repeat the Big Bang once again (so that’s the oscillating Universe scenario)—and you’re obviously right in that assessment. That being said, from some kind of weird existential-philosophical point of view, it’s kind of nice to know that – in theory at least – there is time reversibility indeed (or T symmetry as it’s called by scientists). [Voice booming from the sky] STOP DREAMING ! TIME REVERSIBILITY DOESN’T EXIST ! Parity (P) symmetry or mirror symmetry revolves around the notion that Nature should not distinguish between right- and left-handedness, so everything that works in our world, should also work in the mirror world. Now, the weak force does not respect P symmetry: we need right-handed neutrinos for β– decay, and we’d also need right-handed neutrinos to reverse the process – which actually happens: so, yes, beta decay might be time-reversible but so it doesn’t work with left-handed neutrinos – which is what our ‘right-handed’ neutrinos would be in the ‘mirror world’. Full stop. Our world is different from the mirror world because the weak force knows the difference between left and right – and some stuff only works with left-handed stuff (and then some other stuff only works with right-handed stuff). In short, the weak force doesn’t work the same in the mirror world. In the mirror world, we’d need to throw in left-handed neutrinos for β– decay. Not impossible but a bit of a nuisance, you’ll agree. Charge conjugation or charge (C) symmetry revolves around the notion that a world in which we reverse all (electric) charge signs. Now, the weak force also does not respect C symmetry. I’ll let you go through the reasoning for that, but it’s the same really. Just reversing all signs would not make the weak force ‘work’ in the mirror world: we’d have to ‘keep’ some of the signs – notably those of our W bosons ! Initially, it was thought that the weak force respected the combined CP symmetry (and, therefore, that the principle of P and C symmetry could be substituted by a combined CP symmetry principle) but two experimenters – Val Fitch and James Cronin – got a Nobel Prize when they proved that this was not the case. To be precise, the spontaneous decay of neutral kaons (which is a type of decay mediated by the weak force) does not respect CP symmetry. Now, that was the death blow to time reversibility (T symmetry). Why? Can’t we just make a film of those experiments not respecting P, C or CP symmetry, and then just press the ‘reverse’ button? We could but one can show that the relativistic invariance in Einstein’s relativity theory implies a combined CPT symmetry. Hence, if CP is a broken symmetry, then the T symmetry is also broken. So we could play that film, but the laws of physics would not make sense ! In other words, the weak force does not respect T symmetry either ! To summarize this rather lengthy philosophical digression: a full CPT sequence of operations would work. So we could – in sequence – (1) change all particles to antiparticles (C), (2) reflect the system in a mirror (P), and (3) change the sign of time (T), and we’d have a ‘working’ anti-world that would be just as real as ours. HOWEVER, we do not live in a mirror world. We live in OUR world – and so left-handed is left-handed, and right-handed is right-handed, and positive is positive and negative is negative, and so THERE IS NO TIME REVERSIBILITY: the weak force does not respect T symmetry. Do you understand now why I call the weak force the weird force? Penrose devotes a whole chapter to time reversibility in his Road to Reality, but he does not focus on the weak force. I wonder why. All that rambling on the Second Law of Thermodynamics is great – but one should relate that ‘principle’ to the fundamental forces and, most notably, to the weak force. So that’s what gives mass to our massive W bosons. The Higgs particle is a massive particle itself: an estimated 125-126 GeV/c2, so that’s about 1.5 times the mass of the W bosons. I tried to look into decay widths and all that, but it’s all quite confusing. 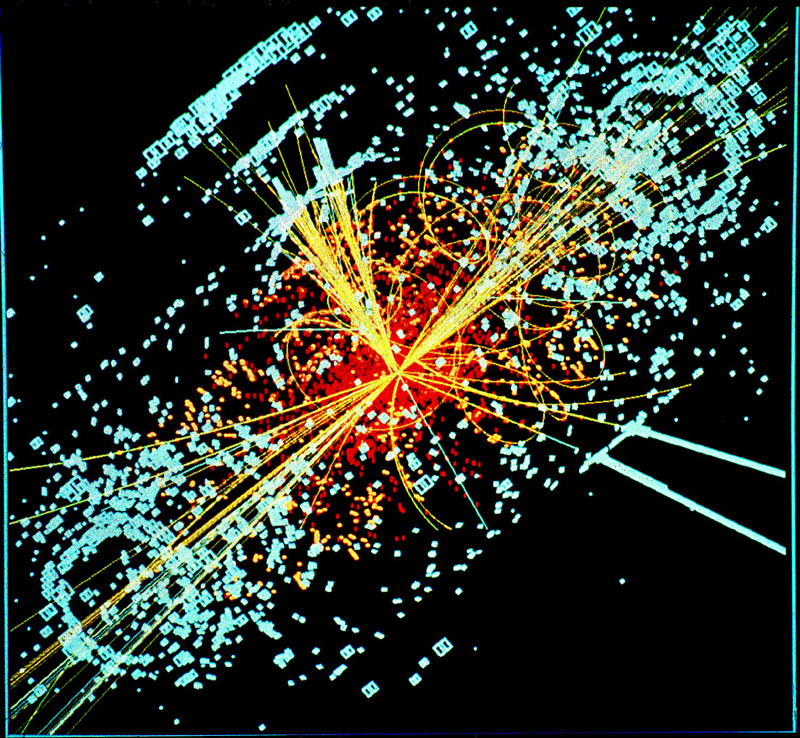 In short, I have no doubt that the Higgs theory is correct – the data is all what we have and then, when everything is said and done, we have an honorable Nobel Prize Committee thinking the evidence is good enough (which – in light of their rather conservative approach (which I fully subscribe too: don’t get me wrong !) – usually means that it’s more than good enough !) – but I can’t help thinking this is a theory which has been designed to match experiment. Hmm… So we assign some qubits to W bosons (sorry for the jargon: I am talking these ‘longitudinal third-polarization components’ here), and to W bosons only, and then we find that the Higgs field gives mass to these bosons only? I might be mistaken – I truly hope so (I’ll find out when I am somewhat stronger in quantum-mechanical math) – but, as for now, it all smells somewhat fishy to me. It’s all consistent, yes – and I am even more skeptical about GUT stuff ! – but it does look somewhat artificial. Oh… And as I’ve inserted some images of collisions already, let me insert some more. 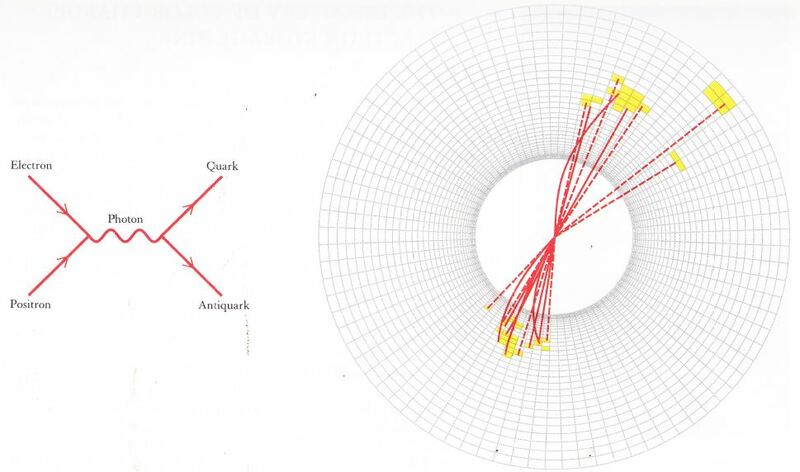 The ones below document the discovery of quarks. 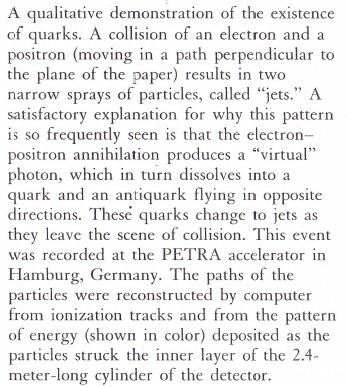 They come out of the above-mentioned coffee table book of Lederman and Schramm (1989). The accompanying texts speak for themselves. Quasi-elastically: ve + d → ve + p + n. So, in this case, the deuteron just breaks up in its two components: one proton and one neutron. That seems to happen pretty frequently because the nuclear forces holding the proton and the neutron together are pretty weak it seems. Alternatively, the solar neutrino can turn a deuteron’s neutron into a second proton, and so that’s what’s depicted in the third diagram above: ve + d → e− + p + p. So what happens really is ve + n → e− + p.
The author of this article – which basically presents the basics of how a new neutrino detector – the Sudbury Neutrino Observatory – is supposed to work – refers to the second process as inverse beta decay – but that’s a rather generic and imprecise term it seems. The conclusion is that the weak force seems to have myriad ways of expressing itself. However, the connection between neutrinos and the weak force seems to need further exploring. As for myself, I’d like to know why the hypothesis that any form of beta decay – or, for that matter, any other expression of the weak force – is actually being triggered by these tiny neutrinos crashing into (other) matter particles would not be reasonable. In such scenario, the W bosons would be reduced to a (very) temporary messy ‘blob’ of energy, combining kinetic, electromagnetic as well as the strong binding energy between quarks if protons and neutrons are involved. Could this ‘odd one out’ be nothing but a pseudo-force? I am no doubt being very simplistic here – but then it’s an interesting possibility, isn’t it? In order to firmly deny it, I’ll need to learn a lot more about neutrinos no doubt – and about how the results of all these collisions in particle accelerators are actually being analyzed and interpreted.